Finding a way to help our patients live their day-to-day lives without pain or activity limitations is among the goals of our orthopedic services at Southcoast Health. One of the ways we do this is by offering several customized options for total joint replacement, including hip replacement, in Fall River, Dartmouth, New Bedford or Wareham, MA. Our team has the tools, expertise and experience to ensure your hip replacement fits you and your lifestyle and helps you stay active. Hip pain or stiffness limits your daily activities. You have hip pain even at rest. X-rays show joint damage with loss of cartilage and bone “wear and tear”. Other treatments like physical therapy, anti-inflammatory medications or joint injections haven’t worked. 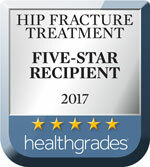 If you are considering this procedure, ask if you are a good candidate for minimally invasive hip replacement surgery in MA or RI. This may allow you to have a faster recovery and less pain compared to open surgery. Prior to surgery, patients are encouraged to participate in the Total Joint Camp. Camp will educate patients and their families about what to expect before, during and after joint replacement surgery. This free class is intended to help you recover more quickly and prepare for an active lifestyle. During the hip replacement, your surgeon will make an incision in the hip to remove damaged or diseased cartilage and bone, replacing it with plastic or metal implants. In most cases, the surgery is a total hip replacement. A partial hip replacement is primarily done for broken or fractured hips. Hip replacement is major surgery that requires general anesthesia and a stay at our hospital. On average, Southcoast Health patients stay in the hospital 2.5 days post-surgery, compared to the national average of 3.3 days. The majority of patients will be discharged to their home with home care services. Some patients may require a short stay at a skilled nursing facility before going home. It will probably be 8 to 12 weeks before you’re feeling back to normal, and full hip replacement recovery can take up to a year. Most of our hip replacement patients return to activities they were not able to do before surgery, and the majority of hip replacements still function well 15 years after surgery. Don’t sacrifice quality with your hip replacement — come to Southcoast Health and have confidence in a positive outcome with your orthopedic surgery. Find a doctor or physician practice near you or contact us online to schedule a consultation. Or you can learn more about joint pain and joint replacement at our Joint Seminar. Call 508-973-1102 to register. Through the orthopedic specialty of Charlton Memorial Hospital, St. Luke’s Hospital, Tobey Hospital and Southcoast Surgery Center, Southcoast Health offers patients resources for hip replacement in Fall River, Dartmouth, New Bedford, Wareham, and surrounding areas of MA and RI.